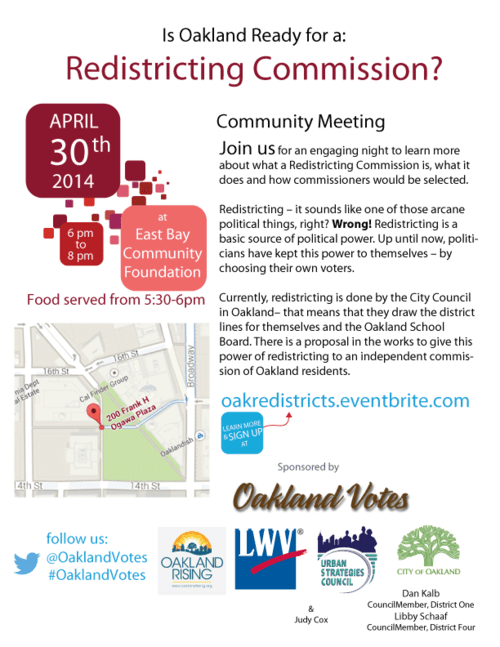 If you’d prefer to never see this kind of mess happening Oakland (thanks Berkeley for the great non-example), you should join Oakland Votes and many residents of the city to work on the creation of an independent Redistricting Commission for our city! Details on the flyer below- this will be a ballot measure this November assuming that city council passes it. The meeting is to get community input into the model Oakland chooses to adopt- both California and Austin have done this and we can learn form their efforts! We’ll have good food and you’ll get to play a valuable part in shaping the future of our city, and the future shape of our council maps too! props to @mollyampersand for the original, distant design elements.